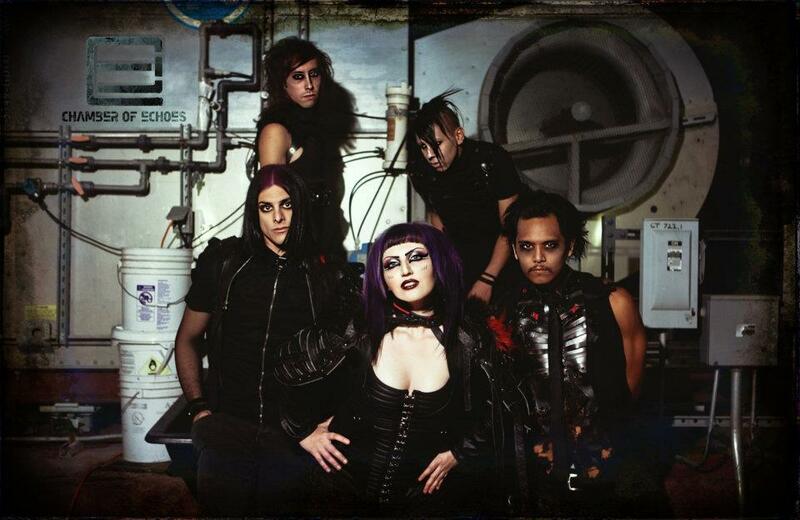 Female fronted industrial act Chamber Of Echoes hails from sunny California but brings a uniqueness they consider to be pop/rocktronica/visual concept being compared to acts like Evanescence and Nine Inch Nails. Having released some music and done extensive amounts of showcases in and around the area these guys have got something going on and don’t plan on stopping anytime soon. Front women Klaryssa spoke to me this project and what we can expect. 1. You have an upcoming album called “World Of Silence” coming out what can you tell me about it? Klaryssa: This is our very first full-length album. I initially started writing the material in early 2011, and I wanted to challenge myself by trying things I normally wouldn’t want to try. This album is different from the other EP’s in that a lot of the tracks are very uptempo and club friendly. I arranged them specifically after traditional pop song structures and what’s popular on the top 40 charts,but with industrial rock and soundtrack aesthetics,effects and of course my previous influences and taking into account the influences and ideas of the rest of the band. Also, there are a lot of new themes about identity, non-conformity, sexuality, self-rights, politics and positiveness. 2. You’re working with Ted Phelps of Imperative Reaction, how did he come into the picture and what does he bring for Chamber of Echoes? Klaryssa: Jeffrey, Xavier and I are big fans of Imperative Reaction. Jeff and I were listening to them in his car admiring the songwriting of the band as well as how amazing Ted makes their mixes sound. I made a joke on Facebook about “What would I have to do to get a remix from Ted Phelps” and all these people started commenting, making jokes about holding him for ransom, etc. lol, when a D.J. friend saw the post and sent him an e-mail. In short, he ended up talking with us about working together and now he is mixing and mastering this album. This is the greatest we’ve ever sounded! He really loves what he does, and his passion really shows through on what he creates. He is extremely professional, patient, open-minded, diligent and hard-working. He really brings out the best in us and captures our true sound!!!! 3. Why did you want to go with naming the band Chamber of Echoes? 5. Can you give us a brief history as to how the band came to be? Klaryssa: I have been a musician and a songwriter since I was a kid. I started writing songs when I was about 11, but they were always piano-based pieces. I started getting into programming and audio engineering in high-school, and that’s when I really discovered my love for Nine Inch Nails, Celldweller,ect. and electronic-based music. Growing up in Orange County, CA, there weren’t a lot of people into that music scene so I started following in my idol’s footsteps (Trent Reznor), initially writing, performing and producing everything myself using any gear I could find or buy for cheap. When I got into college I started taking this idea of a band more seriously, and wanted to make it an all-encompassing creative project, with strong emphasis also on fashion, art & design, and visuals as well. I ended up working with Jay Gordon & Jay Baumgardner at NRG Studios in North Hollywood, CA to produce my first 5-song EP. They wanted to see my idea succeed, so they gave it a more polished audience-friendly traditional pop sound, which was a bit of a different goal than I had in mind. I ended up re-creating the same EP as I had intended at ArtiSans Label Studios in Fullerton, CA and released the two EP’s together in a double-disc package titled “Unbound and Set Free + Under Lock and Key”. In 2010 was I able to find members to bring this project to stage through the internet and mutual friends. Since then, I’ve had about 7 different line-up changes, and in 2011 we created another EP titled “Asylum”. Now we have a dedicated solid line-up. Chris was one of the first original members from when I formed the live act in 2010. He was brought to me by a former member who met him at his first night at Das Bunker, a popular Los Angeles Industrial club. I met Xavier through that former members’ other band, Demona Mortiss. We became good friends, I ended up moving to Los Angeles, and we both agreed he would be a good fit for this project. I met Tim about 5 years ago when I used to see shows for his other band, I Am Ghost,always kept in contact with him and asked if he would be interested in joining. Lastly, I met Jeffrey (My boyfriend) a few weeks after I moved here. He had all the same musical influences as I did, with the same goals in mind, and was the missing piece for the sound I was seeking to achieve. 7. Where are you in the recording process of the new album? Klaryssa: I would say about 3/4 of the way done. It’s taking a bit longer than I would usually like to take, but I don’t want to force the creative process and end up unsatisfied. I want to create a product that our audience will admire and enjoy for years to come and something that will gain new fans and respect. 8. What label will be releasing the album? Klaryssa: Not any specific label yet, but we are shopping around it’s really up in the air whether it will be an independent release or a label release. 9. How would you describe the overall sound of the new album? Klaryssa: As I mentioned before, industrial rock, with anything from dance-pop club influences, to dark cinematic soundtrack embellishments. There are also theatrical intros, and this time around the album is VERY synth-heavy with a lot of electronic percussion and samples. Klaryssa: To get out of my comfort zone really as far as influences and production. Also to really develop the stylization of the band as far as visuals, costumes, etc. Currently we are doing a MAJOR re-vamp of chamberofechoes.com, and are forming the concept of the upcoming album photo shoot and music video for “World of Silence”. It’s still being decided which song is going to be the “single” for the music video. Also before we get back to playing shows this summer, we hope to have our custom lighting and gear stands completed. Klaryssa: This time around I am doing some really intense and intricate programming that literally hurts my brain from all the fine editing. Also, I’m now into building and altering custom drum sounds, and a lot of choppy background vocals, patterns and delays. I’m using a lot of new software that I didn’t initially use before which seems to be most popular with Dubstep DJ’s, Hip-Hop Producers and Video Game Composers. Also I’m recording from obscure European Synths and Modules. 12. When did you start writing for this album? 13. When can we expect the new album to be released? Klaryssa: The latest would be mid-summer. 14. Will you be touring this album? Is there a chance you will be doing a short tour before the album is released? Klaryssa: We are in negotiation with an agency for a possible booking contract for national and international touring. We already started playing some of the new songs from “World of Silence” to audiences the past few months with amazing response. After the album is released we hope to at least do a west coast tour nearing the end of the summer. 15. What more can we expect to see from you guys? Klaryssa: A lot of promotion for the upcoming album, upcoming video blogs, interviews, new photo shoots, and a music video (or two) Plus LOTS OF SHOWS!!! !